This fascinating (and gorgeous) picture book biography is set to release August 22. It’s already been named a Junior Library Guild selection and is getting lots of great buzz. 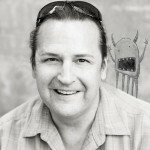 Author/illustrator Don Tate is one busy, talented guy! 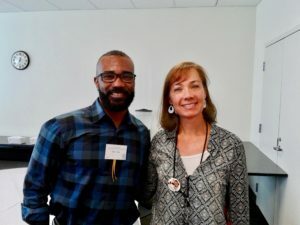 Some of his previous projects include Poet: The Remarkable Story of George Moses Horton (author and illustrator), author of It Jes’ Happened: When Bill Traylor Started to Draw, and illustrator of several picture books, including Whoosh! Lonnie Johnson’s Super-Soaking Stream of Inventions, The Amazing Age of John Roy Lynch, and The Cart That Carried Martin. 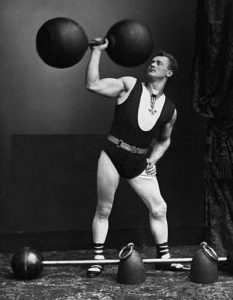 How did you get the idea to write a book about Eugen Sandow? And would you care to you share a bit about your own experiences training and competing as a bodybuilder? I competed in natural bodybuilding nearly 20 years ago, winning first-place in the Open category, and second place in the Novice Men category. I’m not a tall guy, and I wasn’t hugely muscular. Some folks wondered how it was possible that I competed in bodybuilding when I looked nothing like the bulky guys seen in popular bodybuilding magazines. I competed in natural shows, which meant that dangerous growth hormones or steroids were prohibited. True natural competitors focus on working out hard and eat healthy—but no drugs. Therefore, we look like natural, everyday people and not like monster trucks. And actually, that’s what Eugen Sandow was known for. He looked like your typical guy when dressed in a suit. But when he ripped off his shirt—bam!—his muscles exploded. Competitive bodybuilding was so much fun, and I wanted to figure out a way to get that thing I loved into a book. When I came across this picture of Eugen Sandow, his story became mine to write. Did you encounter any challenges, surprises, or unexpected detours in your research for the book? Writing Sandow’s story was a challenge, which I addressed in my Author’s Note. After his death, for reasons unknown, Sandow’s family buried him in an unmarked grave and destroyed his personal belongings. Just think about the primary sources that were lost! More challenging, the sources I used to tell his story contradicted one another. Was Sandow born sickly or not? Was he a weak child or an average child health-wise? Sandow contradicts himself in his own writings. 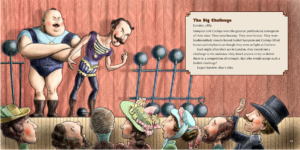 In all honesty, I think some of Sandow’s early biography may have been the creation of an imaginative showman. 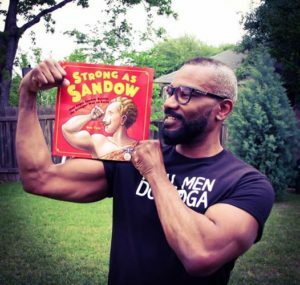 How do you hope STRONG AS SANDOW inspires young readers? I think all of the stories I’ve written support an underlying message of perseverance, of not giving up. Sandow was a weak sickly kid who wanted to get strong. He had many obstacles along the way, but at the end of his life, he had become known as “the Strongest Man on Earth.” That said, I didn’t write the book with the goal of pushing any kind of message. My goal here was to simply entertain my readers, to provide them with something fun to read. I wanted to create a book especially for reluctant boy readers. I was a reluctant reader as a kid, and I would have loved a book like STRONG AS SANDOW. What’s cool, however, is how many people tell me that they are buying the book for their young daughter or niece—it’s a story for everyone to enjoy! 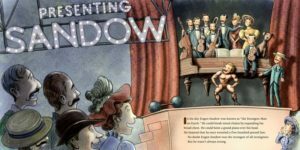 You’re the author of some picture books, the illustrator for others, and sometimes both the author and illustrator (as is the case for STRONG AS SANDOW.) How do you decide which of your writing projects you’ll illustrate? Do you enjoy one aspect (writing or illustrating) more than the other? 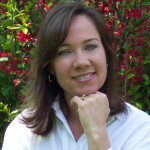 I enjoy all aspects of the book business—writing, illustrating, design, promotion, speaking to kids. STRONG AS SANDOW was my story to write and illustrate, I wouldn’t have had it any other way. But I’m open to—and sometimes prefer—other illustrators creating the visuals for the stories I write. I’ve developed a variety of illustration looks in my work throughout the years, but that doesn’t mean that one of my looks is the best look for a particular text. THANKS so much Don for joining PBB and discussing your great new book! The winner of the book giveaway is Kathleen Mazurowski! 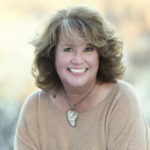 Kathleen, please contact Jennifer Black Reinhardt by emailing her through her website, JBReinhardt.com and she will send you a signed copy of Blue Ethel— CONGRATULATIONS!!!!! 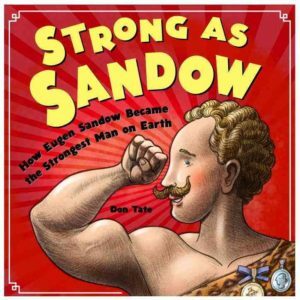 Charlesbridge, Don Tate, picture book biography, strong as sandow. Bookmark. Great interview, Suzanne! I’m looking forward to reading this one. The illustrations are beautiful. I agree Traci! The illustrations are very special. Wonderful interview–and what a fabulous book! I heard Don speak when he visited the Chapel Hill Library a while back, and he was such an inspiration–to the grown-ups as well as the kids. Thanks for the great interview, Suzanne, and congrats to Don–can’t wait to read the new book! Lucky you to hear Don speak! I heard him at PWID. What a treat! He shares such great content with humor and sincerity. What an interesting PB biography subject! I’m looking forward to reading Don’s new book and taking in all his wonderful illustrations. Yes, such a wonderful topic that boys and all readers will enjoy. And even more special because of Don’s personal experiences and background. Thanks! I might not have picked this one up on my own. His book signings could get interesting with this one! So true Mary! With Don’s energy and creativity, I bet his book signings are very unique. What a great topic for a biography, and I love the subtle message of persevering. Looking forward to this one! His message of perseverance is perfect for kids. Thanks for stopping by Judy! This was fascinating, Suzanne. It was very interesting to me to learn that Don is open to other illustrators illustrating his manuscripts and that he truly enjoys all aspects of bookmaking. Thank you! I also found it interesting that even though Don is such a talented illustrator, he enjoys having another artist illustrate some of his books. So cool! What an interesting topic, and the art really does match the material well. Hi Davie. I agree, Don does such a great job matching his art style to his book subject. Great talent! Sorry, meant to type David! Fat fingers this morning. Thank you Don and Suzanne for this fascinating interview and introduction to a book I can’t wait to read! No doubt, readers young and young at heart will love it. Glad you enjoyed the interview Anne. I agree, readers of all ages will find this one fascinating. I love Don Tate’s work. He’s just as nice as he is talented. So true. Don is super nice and super talented! Love Don’s work—can’t wait to see this one! I’ve admired Don’s work for years too, so that’s why it was so exciting for me to meet him. I love Don’s work & look forward to reading this latest PB biography. Thanks for bringing it to my attention.